Following the passage of ESSB 5449, in May 2018, the Office of Superintendent of Public Instruction (OSPI) conducted a survey involving all 295 school districts across Washington to explore what’s currently taking place in terms of policies and procedures regarding media literacy education, digital citizenship and internet safety. Results of this survey will be shared in December 2018. OSPI has also been creating a web-based resource base. More information about this will be available later. Stay tuned. Spurred by the rise of so-called “fake news” and its impact on elections, a Santa Barbara state senator has introduced a bill that would encourage California’s K-12 schools to teach students to be skeptical, informed news consumers. Authored by State Sen. Hannah-Beth Jackson (D-Santa Barbara), SB 203, known as the digital citizenship and media literacy bill, would require the state superintendent of public instruction to convene a committee of educators, librarians, parents, students and media experts to draw up guidelines on how best to recognize fake news. Popularized in the 2016 presidential election, the term “fake news” refers to Internet hoaxes or intentionally fabricated stories presented as news and intended to sway public opinion. Cyber bullying, privacy, copyright infringement, digital footprints, sexting and general Internet safety would also be included in the guidelines. Read more at Ed Source. Image courtesy of Ed Source. Olympia, WA – Governor Jay Inslee has signed into law a new bill requiring Washington schools to develop a model policy to better support internet safety, digital citizenship and media literacy education. The Governor called this piece of legislation “extremely timely. “ He added, “We’re really excited about this bill.” The bill introduced by Senator Marko Liias, 21st District, Lynnwood comes at an important time of heightened scrutiny of information coming from the media and from government sources. We thought some of you might be interested in seeing where our bill is in the legislative process. The information below is taken from the Washington State Legislature about how a bill becomes a law. Our bill is at step 8. Almost there! For those of us old enough to remember, this whole thing is very Schoolhouse Rocky. Yay! Our bill has passed the House and is now on it’s way to the Governor’s office for signing. We are ecstatic it has passed and we now have a second bill addressing this important subject. Thank you everyone for your support in commenting on this bill and sharing just how much we need digital citizenship/media literacy education in our schools. Update: Digital Citizenship/Media Literacy bill, we need your support! Yesterday, members of AME went to Olympia, WA to testify in support of the Digital Citizenship/Media Literacy bill. This is when we need your help to comment in support this bill! Please be sure to go the link for our bill and leave a comment in the comment box. It’s very easy to do and only takes a few minutes. You don’t need to know your district representatives, you only need to give your zip code and your comment will be sent to your district’s representatives. HURRAY!!! On March 2, 2017 Bill 5449 passed the Senate floor yeas, 40; nays, 9; with only 2 small substitute word changes. Now it’s on the way to the House. Its next public hearing at the House Education Committee is Thursday, March 16 at 8 a.m.
We continue to encourage you and any others you may know to show your support as the bill moves to the House. If you haven’t already done so, please visit this link. You’ll see the box Comment on this Bill to the right of the box labeled Bill Status at a Glance. It’s very easy to indicate your support and only takes a very few minutes. We’ll keep you updated on the bill’s progress. So far, so good! In the meantime, please feel free to contact us. 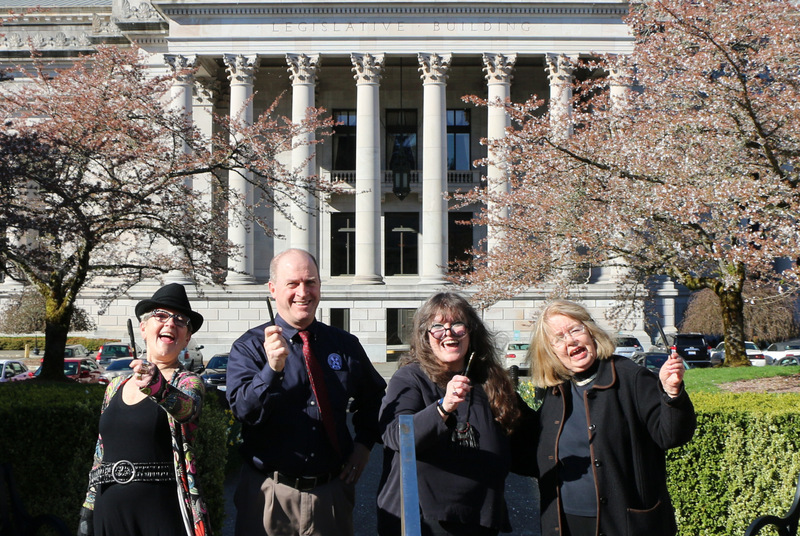 Here’s several photos from our recent trip to Olympia, WA in support of Senate Bill 5449. AME members with fellow supporters. AME members Linda Kennedy and Marilyn Cohen speak with Executive Legislative Assistant Curt Kohlwes. The first public hearing for Senate Bill 5449 was held Monday, February 13 at 1:30 p.m. at the Cherberg Building in Olympia, WA. The proposed bill included three of the five recommendations made in the OSPI legislative report. View the powerful statements made in support of the bill, discussed starting around 52:08 in the video below. Additionally, today the bill is scheduled for executive session in the Senate Committee on Early Learning & K-12 Education at 1:30 p.m. Stand by to hear more about how this hearing will go, or watch it live here. Please consider showing your show support for bill SB 5449, especially in a time when media literacy education is more important than ever. To do so, visit this link. At the top of the page on the right are the words “Comment on this bill” OR “Get Email Notification” OR “RSS Notifications.” Please consider following the bill updates, or leave a comment to provide feedback. Recently the National Association for Media Literacy (NAMLE) sat down with AME’s own Marilyn Cohen, focusing on her work as Director of the Northwest Center for Excellence in Media Literacy based in the College of Education at the University of Washington. While their conversation covered the many facets of the NW Center, it also focused on Action for Media Education’s amazing work in its 25 years, and triumph earlier in 2016 as it successfully lobbied for media literacy legislation. As Washington becomes the first state to pass this ground-breaking legislation, Marilyn and her AME colleagues look forward to helping and supporting others in the media literacy community across the U.S. in their quest to pass similar legislation in their respective states. Read more in the NAMLE August bulletin. 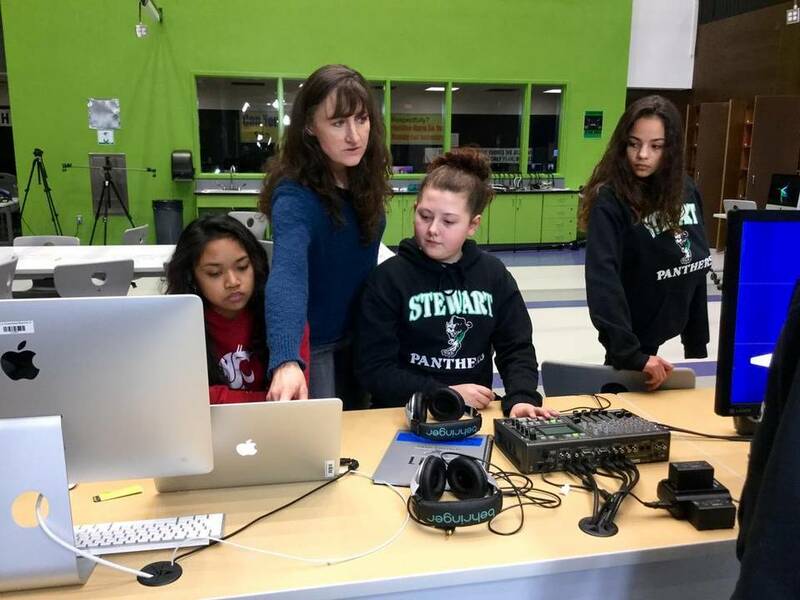 Washington State’s new, progressive media literacy law provides leadership for a growing number of states advocating for digital citizenship and media literacy education. Washington’s Office of Superintendent of Public Instruction (OSPI) is now empowered to develop best practices and recommendations for teaching literacy that encompasses both new media and new technologies. The Digital Citizenship /Media Literacy bill address the growing public concern regarding the way our children use media screens and what the screens teach children about the world. Sponsored by Senator Marko Liias (D, Lynnwood), the bill establishes a process to ensure ongoing discussion and action at both the state and local school district levels. It stresses that our children must learn how to safely, ethically, responsibly, and effectively use technology. “Our schools can and must play a leading role in teaching students to become safe, principled users of digital resources in an increasingly complex communications environment,” said Senator Liias. Washington’s Office of the Superintendent of Public Instruction (OSPI) will work with an advisory group to identify best instructional practices and develop a set of recommendations on digital citizenship, Internet safety, and media literacy. Beginning in 2017-18, school districts will be required to annually review their policies and procedures on electronic resources and Internet safety and to consider OSPI recommendations. Seattle-based nonprofit Action for Media Education (AME) proposed the bill. AME’s mission throughout its 25 year history has been to foster and promote digital and media literacy for children and the citizenry at large. AME president, Claire Beach, says the need for this bill has never been greater. According to a recent study, teenagers use an average of nine hours of entertainment media per day and tweens (ages 8-12) use an average of six hours a day, not including time spent using media for school or homework. (Common Sense Media, 2015). Many of our children spend more time in front of screens than with any other activity besides, perhaps, sleeping. “In this 21st century, our definition of literacy must be expanded to include digital and media literacy education,” said Marilyn Cohen, Director of the NW Center for Excellence in Media Literacy at the University of Washington. Though digital communications have had many positive influences on the world, parents and educators have expressed concerns. Cyberbullying and sub-tweeting, for example, occur at alarming rates and can have devastating results. Media can create false realities. Children do not have the years or the sophistication to understand and process all the material exposed to them. Digital and media literacy are essential 21st century skills which help students navigate the world. Media literacy teaches them to recognize stereotypes and bias; it teaches them to look for what is left out of the message; and to ethically and responsibly use the tools given to them. View the official AME press release. We launched Media Literacy Now to put media literacy on the public policy agenda. Today, we reached a major milestone in Washington State when state Sen. Marko Liias (D-Lynnwood) spoke to his colleagues about media literacy and digital citizenship on the floor of the state senate. He was joined by Sen. Steve Litzow, (R-Bellevue), the chair of the Early Learning & K-12 Education Committee, in calling for the senators’ support. The bill now moves to the Washington state House of Representatives for consideration.